In BIYT’s newest production we take a look at the corrupting nature of ambition and the destruction that stems from ruthless power. Flattered, praised and rewarded as a hero, Macbeth encounters three witches who foretell of an even greater success. They predict his rise to the throne. This prediction prompts him, along with his wife, to secure his destiny by committing a series of murders, pulling them into a downward spiral of guilt and paranoia. 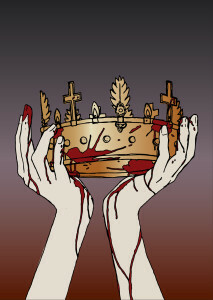 Once violence is chosen as a means of achieving power, it proves impossible to stop and Macbeth’s inexorable loss of morality reminds us of how one evil minute can change a life forever. Thunder! Lightning! Blood! Gore! Witches ! The performance lasts approximately 1 hour and 50 minutes with a ten-minute intermission.